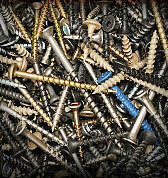 One of the quickest ways to fasten two pieces of wood is to use screws. But not all screws are the same. Years ago I started by using drywall screws from the big box store. They are good for drywall, but that is it. They have very little strength. Currently, I get my screws from McFeely’s. Their square drive screws are much easier to use than normal philips head screws (there is a much more positive connection between the driver and the screw). I would recommend starting with a #8 flathead screw assortment of whatever finish you like. And currently McFeely’s is having a $1 shipping and handling special (for the ﻿﻿﻿﻿continental US only).